Tim went home to be with his Lord on Monday, September 26, 2016 at the General Campus of the Ottawa Hospital at the age of 65. Beloved husband of Margaret (Rose). Predeceased by his parents Bill and Lil and his wife Sharron (Dillabough). Proud and loving father of Karen Sloan (Burt) of Ventnor, Lori Bond (Jamie Crook), Charlie (Heather) both of Kemptville and Lina Theobald (Martin) of Bishops Mills. Precious grandfather of Brody and Rebecca Hodges, Ryker Theobald, Quentin Bond and Maysen Sloan. Dear brother of Janice Hyndman (Reg) of Kemptville and Ruth Bond (Allan Hoy) of Mountain Twp. Tim will be greatly missed by brothers-in-law Andrew Rose, John Rose, William James Rose, and Bernard Rose, sisters-in-law Catherine Skinner, and Therese Rose-Michniak all of Peterborough. Tim will be fondly remembered by mothers-in-law Eva Dillabough and Marthanne Rose and the entire Dillabough and Rose families. As a firefighter and fire chief in Kemptville, Tim ultimately, through Non-Hodgkins Lymphoma, gave his life to help protect his community. Tim’s family wants to thank Dr. Leahy (his family doctor), Dr. Altouri (his oncologist), the nurses, support staff and caregivers at the General Hospital for the compassionate and respectful care given to Tim and his family over the past year. Special thanks to Tim’s best friend, Dan Gordon, for always being there when needed. 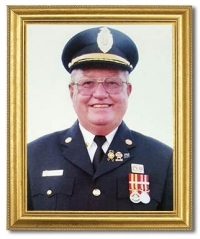 Tim became a volunteer firefighter with the Kemptville Fire Department on February 3rd, 1972. He held the position of volunteer Captain from January 1977. His appointment as Fire Chief on August 27th, 1991 on a volunteer basis. He became full time in early 1992 until 2012. Friends may visit the Brown Chapel of Hulse, Playfair & McGarry, 805 Prescott Street, Kemptville, Ontario on Saturday, October 1 from 2 to 8 pm and Sunday, October 2 from 2 to 8pm. The Funeral Service will take place at the North Grenville Municipal Centre on Monday, October 3 at 2:00 pm. Internment at South Gower Cemetery to follow the Service. Donations to St. Paul’s Presbyterian Church in Kemptville or to a charity of your choice would be gratefully acknowledged by the family.